This one reminds me a bit of the enameled copper pieces popular in the 70s! 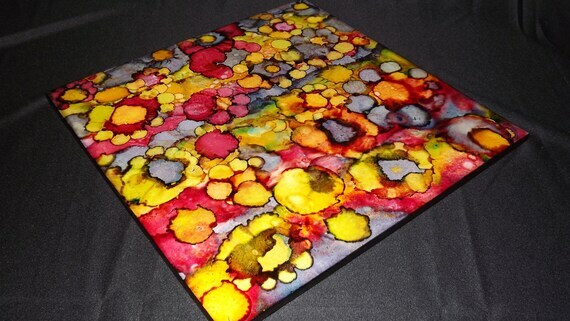 1.What is alcohol ink and what is so good about it? Alcohol inks are by far my favorite medium to work with. It is a versatile acid free ink. It reminds me a lot of tie dye in the sense you have a lot of freedom with colors and mixing. 2. Can you drink it? Most definitely not! I would stick with a nice glass of wine if you are looking for something to drink. 3. 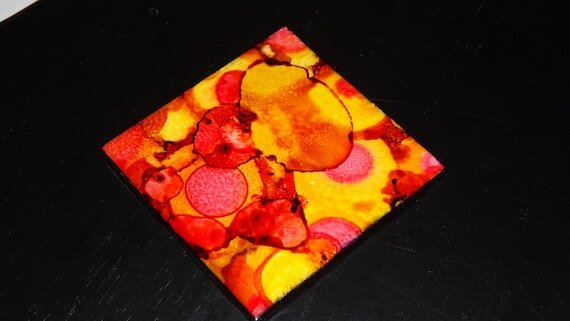 When did you first start making coasters and how did you get the idea? 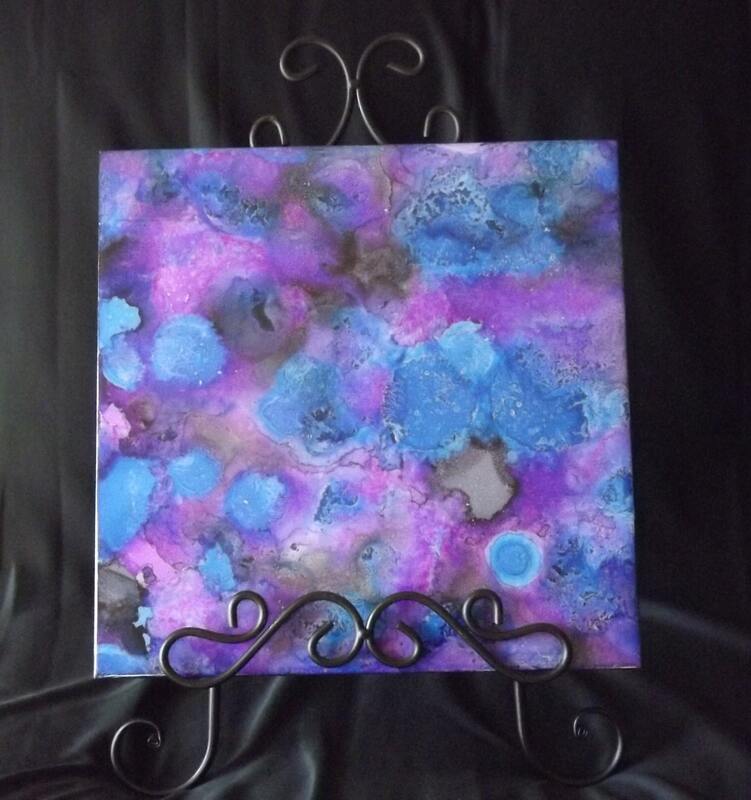 I had been eyeing alcohol inks for a while so one day I decided to give it a whirl. I started out with 3 colors for a trial run. And as soon as I tried them I was completely hooked. It was fascinating to see all the colors and how they combined and mixed. You will notice that all my products are different and reflect a unique style. 4. What is your favourite thing to make? 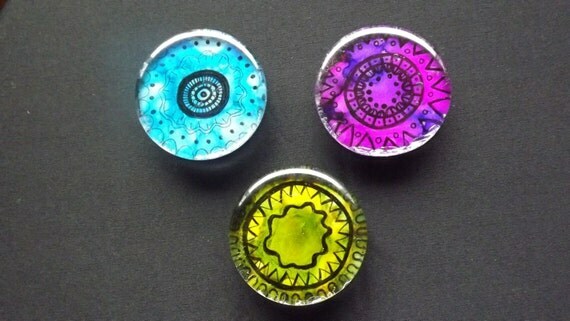 I love doing it all, but lately I have branched out on making alcohol ink pebble magnets and they have been very fun to do. It allows me to incorporate doodle art as well, which is something else that I love. 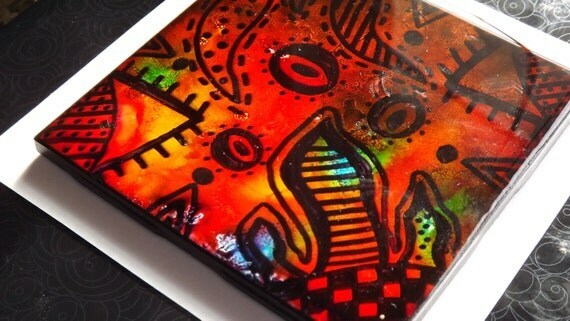 When you visit my shop you will see I have done doodle art and various tiles as well. 5. What is the best thing about having an Etsy shop? All in all it is a lot of work, but you have the opportunity to meet and connect with some really neat people. The etsy community is very accepting and always wants to help other estians. Whenever you need help you can always count on someone to answer your questions or direct you to where you need to look. It has also given me a chance to reconnect with my creative side and plug my emotions into an outlet that is very productive. 6. Where do you get your ideas/inspiration for your pieces? While I am creating a big part that plays into my creativity is my emotions. I have to be in a carefree relaxing state of mind in order to properly create something that I love. Many times I will sit down to start a piece of art, then when I step back and view it I think of it as just ok. With a little more color and love being poured in it, it usually ends up being one of my favorite pieces of art. Thanks Ashley for sharing about how you come up with your colourful creations! Just checked out Ashley's shop....very unique! Love the personalized family hands! I've never seen anything like it. Very nice shop and wonderful blog post. Thank you Hannah for the wonderful blog post. Everyone enter coupon code BLOG15 during checkout to receive 15% off your purchase. I tried the this before using rubbing alcohol with watercolors. It does have a nice effect. Such great colors! I learned something new.